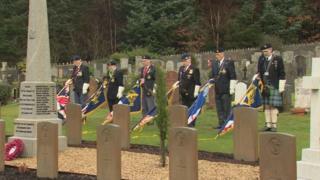 A ceremony has been held at Faslane on the Gareloch to mark the centenary of a tragedy in which 32 men died when the engine room was flooded during a dive. The incident was one of the first successful submarine rescues - after a further 48 men onboard were saved. The vessel, K13, was taking part in its final sea trials when seawater entered its engine room, causing an explosion. Among those who died were workers from Fairfields shipyard in Govan, which had built the vessel. A total of 80 men were onboard K13 as it prepared for a final dive. Although the manoeuvre began well, the captain, Lt Cmdr Godfrey Herbert was unable to settle the vessel on an even trim, and at a depth of 20ft (6m) the boiler room reported that the compartment was flooding. K13 eventually settled on the bottom of the loch, 50ft (16m) below the surface. The torpedo room was completely flooded and 31 men in the engine room were drowned. An Admiralty Inquiry later heard from divers who reported finding four 37in (94cm) ventilators over the boiler room open, indicators in the boiler room set open and the engine-room hatch undone. Cdr Francis Goodhart, who was an observer on the vessel in preparation for his own submarine's completion, volunteered to attempt to escape to the surface to organise a rescue. But as he left the conning tower, he was blown by high-pressure air against the super-structure, and killed, leaving Lt Cdr Herbert to raise the alarm. Cdr Goodhart was posthumously awarded the Albert Medal in Gold For Gallantry in Saving Life at Sea. But it took a total of 57 hours before an airline could be attached to the sunken vessel, giving the survivors vital oxygen, and allowing the submarine's bow to be raised. Rescuers then cut a hole in the hull to allow the remaining 48 men onboard to be freed. Sunday's ceremony was organised by the Submariners' Association (SA). It is held every year at Faslane Cemetery which is maintained by the Commonwealth War Graves Commission (CWGC). SA chairman Jim McMaster said it was important to remember both the dead and the skill of those who carried out a successful rescue. He said: "It is right and proper that we remember those who have gone before us, the brave men who earned the reputation we enjoy today. "It is natural that we commemorate those 32 unfortunate men who died in this accident but we should not lose sight of the fact that this was also a very successful submarine rescue for 48 men. "Even by today's standard, this is a major achievement." K13 was raised from the Gareloch in March 1917 and returned to service seven months later as HMS K22. Since the tragedy, no Royal Navy vessel has borne the number 13. Colin Kerr, director of external relations for CWGC, said: "CWGC has looked after the graves of the men of the K13 for a hundred years. This is what we do. "It is very important to us that attention is still paid to these men and that their graves are visited and their lives remembered." During the ceremony, submariners past and present paid their respects, along with relatives of some of those who died. It ended with a march to the grave of Cdr Goodhart. Rear Adm John Weale, head of the UK's Submarine Service, said: "The men who perished in K13 were, in many respects, pioneers who pushed the boundaries to gain an operational advantage over potential adversaries. "Today's submariners recognise that the submarines they operate are not only safer, but also more effective, because we have learned from the experience of our predecessors. "In this respect, the special bravery, ethos and comradeship of submariners and the submarine service endures." Although, following the K13 disaster, there was pressure on the Royal Navy not to give any further vessel the 'unlucky' number at least one more submarine did go to sea bearing number 13. Retired submariner Mo Morrison told BBC News: "HMS submarine Osiris had the pennant number S13 and we had a tradition of diving on Friday the 13th at 1313 down to 130 ft where we would remain for 13 minutes before surfacing."